Cardiorespiratory benefits of systemic CDC or EXO delivery. (A) Schematic of the experimental design. Mice underwent baseline testing of exercise capacity and cardiac function, and then were injected with vehicle control (Dulbecco’s PBS; 100 μl), cardiosphere-derived cells (CDCs; 2.5 × 105 cells per 100 μl), or CDC-derived exosomes (EXOs; 2.0 × 109 particles per 100 μl) into the femoral vein. Animals were reassessed for exercise capacity and cardiac function 3 weeks later. (B and C) Exercise capacity, as determined by a graded exercise test, was significantly improved in CDC- and EXO-treated mdx mice after 3 weeks (n = 8–10 per group; WT n = 9). This effect was maintained for at least 6 weeks following CDC treatment (n = 5). (D) Representative echocardiogram tracings. 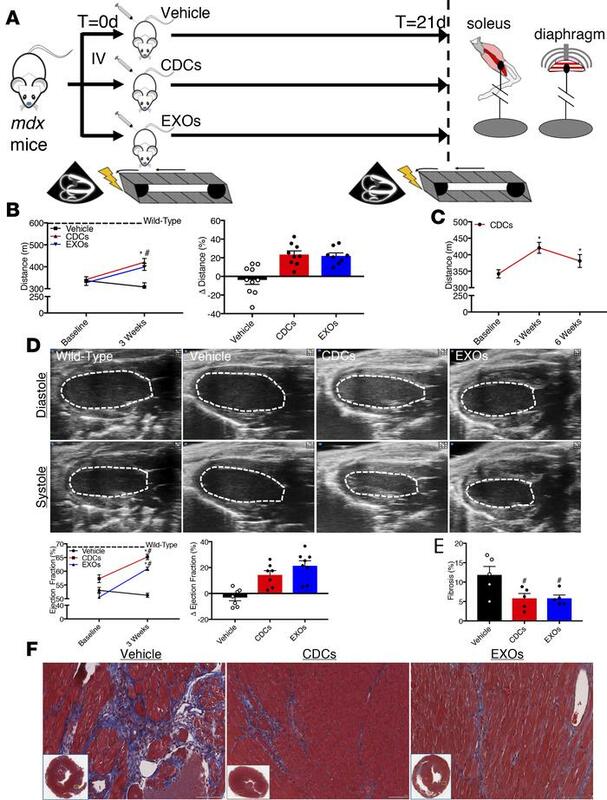 Cardiac function, as measured by transthoracic echocardiography, was significantly improved in CDC- and EXO-treated mdx mice after 3 weeks (n = 7–8 per group; WT n = 7). (E) Pooled data from F reveal less interstitial fibrosis in CDC- and EXO-treated mdx hearts (n = 5 per group). (F) Representative Masson’s trichrome–stained micrographs from vehicle-treated, CDC-treated, and EXO-treated mdx hearts. Scale bars: 100 μm. Bar graphs depict mean ± SEM. Statistical significance was determined by ANOVA with P ≤ 0.05. When appropriate, a Newman-Keuls correction for multiple comparisons was applied. *Significantly different from baseline; #significantly different from vehicle. Dashed line represents mean of WT values.